Shutters originally were designed to cover an opening around a window and protect the interior of a home (e.g. from weather, animals). Different styles were needed in different climates. ​Hot and humid climates gave rise to the ventilated louvered shutters. Raised panel shutters were needed in the colder climates where winter wind, ice and snow could damage window frames and glass. In rural areas more simple board and batten shutters were most common. Based on this, we recommend considering your home style when selecting your shutter. A New England colonial heritage style home works well with raised panel shutters. Homes based on Southern architecture should have louvered shutters. An “informal” styled homes often look best with board shutters. Determining the size of your shutter is easy! Each shutter should be exactly one-half the width of the window, regardless of how wide the window is and the length should exactly match the window. This will give a believable appearance that the shutters could actually be closed to protect against sun, storms, or cold. The rule of thumb on the width means shutters rarely work on multiple-window openings (see photo to right). They look silly if the shutters aren’t big enough to cover the opening and ridiculous if they are. 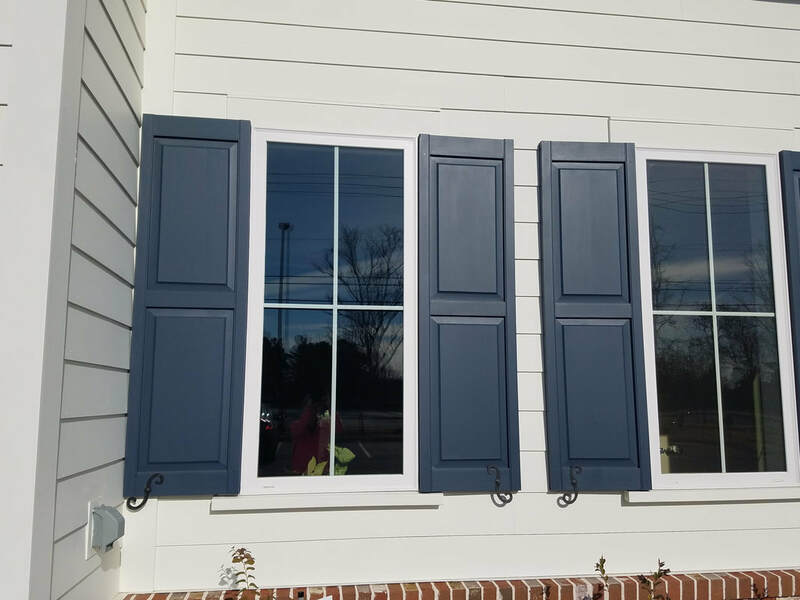 ​We offer shutters in a variety of standard widths and lengths as well as custom sizing to ensure you get the perfect fit. A typical home color scheme has two or three colors. Shutters should be painted the accent color. This means your new shutters should match the color of the front door or windows. For a subtle look, stay within the same color family as your home’s exterior. For a dark exterior, choose a shutter color a few shades lighter and for lighter exteriors a few shades darker. For a bold look, use dark or brightly colored shutters on a light exterior like deep red, charcoal gray or forest green. ​Still unsure? Stick to the basics. When in doubt, white or black go with any exterior color scheme! Because they don’t need to be functional, shutters are often attached directly to a home’s siding or brick with screws. We recommend attaching shutters with actual hinges, either working or simulated. With a hinged attachment, the shutters will fold back slightly against the wall giving a greater sense of depth. Shutter “dogs” hold the shutters against the side of your house and keep them from swinging in the breeze. Shutters should always be mounted on the side window trim rather than against the outside edges of it. This is so that if the shutters were actually closed over the window there wouldn’t be a gap in between. Shutters don’t work on a house that doesn’t have room for them – plain and simple. If a window is too close to a corner or to close to another window, adding shutters simply won’t fit. If you have an oddly placed or sized window, consider leaving it without a shutter instead of calling attention to it. ​Following these steps should ensure you select the proper shutters to accentuate your home. Still have questions? We’ve been installing shutters for years and can help with your selection process or advise on a question not addressed here. Give us a call.